I was searching the Chronicling America collection at Library of Congress Website. They’ve added a few years to their Garden Island Newspaper collection. The newspaper now covers through 1920. I didn’t have much luck on the pre-1910 edition, but I expected to do better with these later years. As I was browsing around I came across an article that caught my interest. 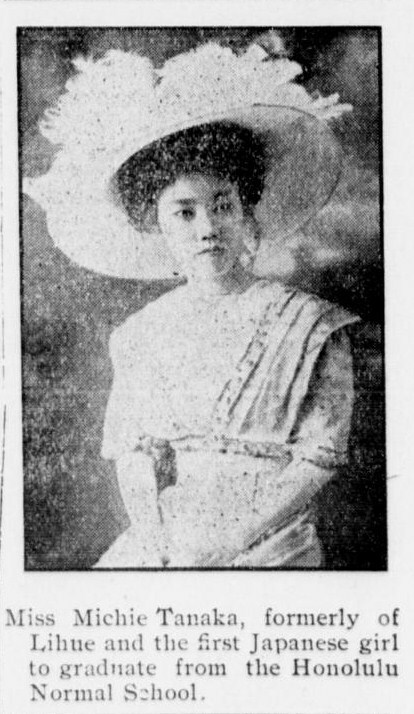 “Kauai Furnished First Japanese Girl to Graduate from Normal”. Michie Tanaka was born in Lihue on Kauai. She was the daughter of Rev. and Mrs. Miyasaki. She had dreams of being a school teacher. When she finished sixth grade, her parents moved to Honolulu so that she could go to the Honolulu Normal School and get the education she needed to get her teaching credentials. Michie became the first Japanese female to graduate from the Honolulu Normal School in 1913. Then, she was employed as a teacher at Kaahumanu School. 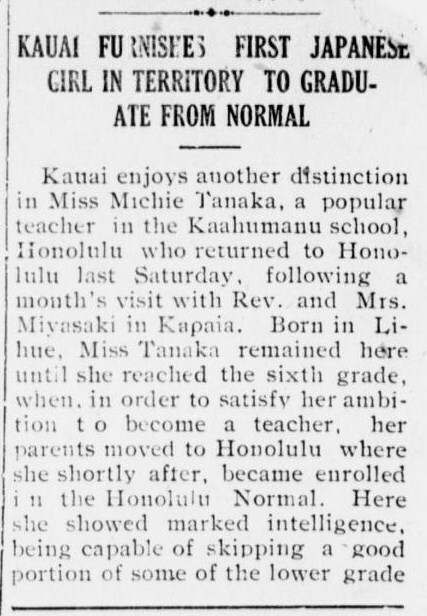 Source: Garden Island Newspaper, “Kauai Furnished First Japanese Girl to Graduate from Normal”, 19 Aug 1913, Front Page, column 6.